At Gibbons Leis, PLLC, we focus on a variety of practice areas involving employee rights. If you are owed overtime pay, minimum wages, or other compensation; you have been a victim of discrimination, retaliation, or harassment; or you have a Family and Medical Leave Act issue, we can help. If you are no longer able to work because of a serious injury or disability, we can help you with claims for Social Security disability benefits and long-term disability insurance. Attorney Gibbons was very patient and caring. I would recommend him to everyone. Phil and his team have been great. When facing employment discrimination, wage & hour violations, or questions about an employment contract, it can be hard to know where to turn. You’re certainly not going to get any help from your employer, but you may not know when it’s time to talk to a lawyer. Likewise, if an illness or injury prevents you from working, dealing with the Social Security Administration or a disability insurance company can be frustrating and confusing. With a free telephone case evaluation at Gibbons Leis, PLLC, however, you have nothing to lose. We will listen to your story and let you know if it’s time to take legal action—all at no cost or commitment from you. Employers in North Carolina are bound by state and federal law to treat their workers fairly regardless of age, gender, or race; to honor contracts; to pay fair wages; and to compensate workers for overtime. 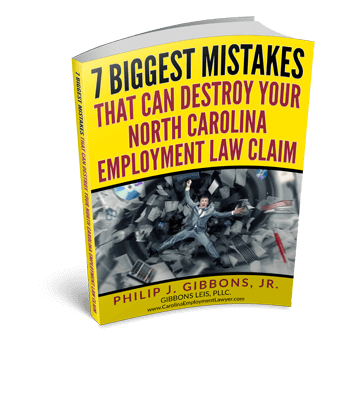 If you suspect your employer has broken these laws, contact Gibbons Leis, PLLC. If you have become disabled because of an illness or injury and can no longer work, you may qualify for Social Security Disability Insurance benefits. Some employees are also covered by short-term and long-term disability insurance policies, which are supposed to provide benefits to eligible sick and injured workers. If you have questions about your disability benefits, contact Gibbons Leis, PLLC. We focus exclusively on employment and disability issues, representing wronged employees and helping them exercise their rights and recover compensation for their losses. Wage & overtime violations. Failing to pay an employee or denying overtime pay violates your rights. We can help you recover the unpaid wages your employer owes you. Discrimination. We hold employers responsible for inequitable treatment based on race, gender, religion, disability, national origin, age, or pregnancy. Sexual harassment. Whether an employer is directly responsible for the harassment or allows it, you may have a case and could be entitled to damages. Contract disputes. Terms of an employment contract, severance agreement, or non-compete agreement may require our review or negotiation. Retaliation. If an employer retaliates against you for legally protected actions you took, it could be liable for damages. Family and Medical Leave Act violations. Employers who discipline workers for exercising their rights under FMLA may owe damages to wronged employees. Social Security Disability Insurance. If you are seeking Social Security disability benefits, we can assist you with the application process or represent you before an administrative law judge if your benefits have been denied. Long-Term Disability Insurance. Insurance companies deny disability claims every day. If you have purchased a disability insurance policy privately or through your employer and your benefits have been denied, we can help you with your appeal. Gibbons Leis, PLLC protects employee rights at every stage of employment, from pre-hire to termination, including issues faced by employees who are no longer able to work because of an injury or disability. We are very selective about the cases we take and understand the issues faced by our clients. Our attorneys and their families have experienced serious illness and job loss themselves, and we relate to our clients on a level that can only come from having experienced some of the same life issues faced by our clients. We don’t want to waste your time or ours, so we will review your case at no charge and with no obligation to hire us. Even if we cannot represent you, the telephone case evaluation is confidential, and you will have a better understanding of your legal rights. With nearly 40 years of combined employment law experience, our attorneys bring a deep understanding to this area of the law. Having represented employers in the past, we know how to beat them at their own game. You will receive personal attention, professional representation, and regular updates on the status of your case. You can depend on us to provide you with aggressive representation and common sense legal advice. Employment and disability law is all we do. If you are having an issue with your employer, or you have been wrongly denied disability benefits, you have nothing to lose by contacting us for a case evaluation. Don’t put up with unfair and illegal treatment any longer. Take action by contacting us today. Download now to help increase your odds of winning your employment law case. Q. What Am I Entitled To Receive If I File An Overtime Lawsuit In North Carolina And Win? Q. Is Time and a Half Mandatory for Overtime? Q. What Are Some Examples Of Illegal Compensation Methods Used In North Carolina? Q. Can my employer fire me for filing an overtime claim? Q. When Should Overtime Be Paid? If you believe your employee rights have been violated, or you need assistance with a disability claim, fill out our contact form and tell us a little bit about your case.